Virginia has been touted as the birthplace of the nation as well as the gateway to the South. It is home to the Blue Ridge Mountains, and Virginia is also for lovers—moth lovers especially. Among the state’s dogwood trees and foliage, some of the most interesting and beautiful moths are found. 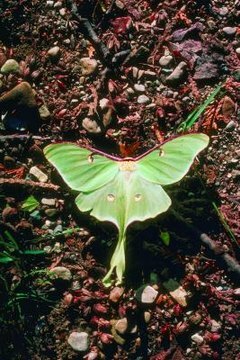 Since they only fly at night, luna moths are named for the moon. They are among the larger moths, with a wingspan of around 5 inches. Their wings are light green with distinctive eyespots. During spring and summer months, females lay eggs on the backs of black walnut leaves. These hatch in about 10 days. Their caterpillars will continue to eat and grow for three to four weeks, until it is time for them to cocoon. Since adults do not have mouths, they do not eat. They live just long enough to mate—about a week. Adult rosy maple moths also do not have mouths, and live to mate. They are an average-size moth with a wingspan of around 1 to 2 inches, and the pink on their wings makes them easy to recognize, although the amount of pink will vary, as will their base color of white or cream. They mate in the evening, and the next day females lay eggs that will hatch in approximately two weeks. As caterpillars they are hearty eaters, and in large populations can make themselves unwelcome by defoliating trees. At first glance one might mistake hummingbird moths for their namesakes. They feed on nectar, and their rapid wingbeats make their wings almost invisible. They are among the few moths that fly in full daylight, and they can be found from gardens to meadows—wherever flowers are producing nectar. As caterpillars they cocoon and hibernate under leaves on the ground during winter months, and begin emerging in late spring. They are also known as clearwing moths, though when they first emerge their wings have brownish scales. These scales fall off during their first flight, leaving clear centers. "Bella" means "beautiful" and these moths are aptly named. They have distinctive rows of black spots on their wings, yet underneath, their colors can vary from yellow and pink to white. Their colors are even bright and beautiful during those awkward larvae and pupae stages, with various markings in shades of orange and black. However, do not let their beauty fool you. Their host plants harbor repellant alkaloids that the larvae sequester, making them poisonous to predators from egg stage to adult.